When your scale models, interactive maps, star ceilings or other special (effect) displays need indicator lights, you may want to look at what the "Twinkler" can provide. The Twinkler is a bright (low-power) RGB LED mounted on a miniature circuit board together with a controller and a provision for a light pipe. A Twinkler can run stand-alone, playing a schedule stored in its non-volatile memory, or be driven by a personal computer (or other system). An arbitrary number of Twinklers can be chained together on a single serial bus, allowing a single PC to control hundredths of Twinklers. Each Twinkler can still be adjusted individually if they are on a bus. Alternatively, use our printable order form (PDF). The latest software revision is version 1.1, build 4319. A brochure of the Twinkler product. The User Guide, which includes the specifications of the Twinkler. More documents and downloads are at the end of this page, section "References & documentation". A Twinkler can run stand-alone, or under control of a computer or other kind of controlling device. A mixture of these two, where the computer only sends commands to switch to another schedule and the Twinkler then runs that schedule independently, is also possible. An arbitrary number of Twinklers can be chained together. All Twinklers that are connected in cascade (forming a serial bus), synchronize their timers. The Twinklers are easily mounted behind a map or (thin) wall, or below a table by using light pipes (or "light guides"). The surface of the map or table remains flat and smooth. Several styles of light pipes are available. A single cable to the Twinklers carries both data (for lighting control) and power. This eases the cabling of many projects. Even when running in stand-alone mode, the Twinklers allow for some interactivity. A single input line starts or restarts a schedule. Because of this, interactive maps or scale models can be built without any (personal) computer or other logic device —provided that only a single switch is needed per chain of Twinklers. The Twinkler has an RGB LED and allows each channel to be dimmed with six levels (including off and full on). This gives a palette of 216 colours. 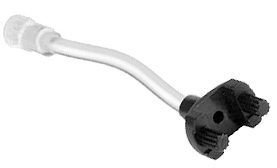 The Twinkler's design is optimized for reliability. It operates under a large temperature range. All input and output pins are EMC filtered; the power lines are also EMC filtered. The device is compliant to EMC and ESD regulations, as well as RoHS-conforming. Each Twinkler has an internal power regulator, which ensures that all Twinklers on a chain are equally bright (within the tolerances of the LED luminance). Without such regulators, power losses in the cables would make the LED at the end of a chain less bright than the ones at the start. The Twinklers do not suffer from this effect. 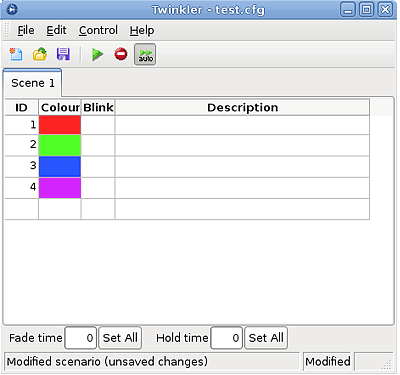 The Twinkler hardware comes with free software for creating a schedule, controlling Twinklers and optionally storing the schedule in a chain of Twinklers. This program runs on Microsoft Windows and on Linux. The program supports up to four switches with configurable functionality (for interactively starting/stopping a schedule, or browsing through it). For downloads of this software, see the section "Software & drivers". If you wish to write your own software, we provide the a detailed description of the serial protocol, including programming examples, in the section "References & documentation". To put the Twinklers into use, you will need a few accessories, in addition to the Twinklers, such as cables to connect a set of Twinklers in a chain, light pipes suitable for your application and an interface to other hardware or to power supplies. If a chain of Twinklers runs a schedule as a self-contained unit, you need a "power repeater" board. This is a simple passive board, that has a standard DC power connector for a power supply and "Micro-MaTch" connectors for connection to the first Twinkler in the chain. When a chain of Twinklers is connected to a computer, you need an interface from that computer to the first Twinkler in the chain. 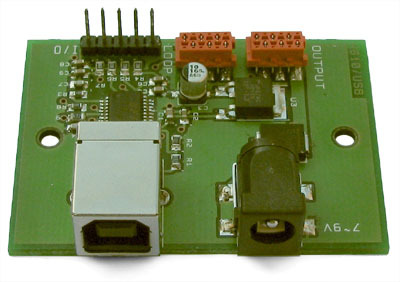 Two such interfaces are available: one using USB and one using RS232. Both interfaces also function as a power repeater. The USB version has the additional feature that it supports up to four external switches. The function of these switches is configurable in the software. Twinklers are chained together with 6-wire ribbon cables, connecting the output of one Twinkler to the input of the next Twinkler. To avoid large currents to run over the bus formed by these cables (and the associated power loss), it is advised to add a power repeater after every 75 Twinklers in a chain. Therefore, if you have a long chain of Twinklers connected to a PC, you need one interface (which controls all Twinklers and powers the first 75), plus a power repeater for every additional segment of 75 Twinklers. 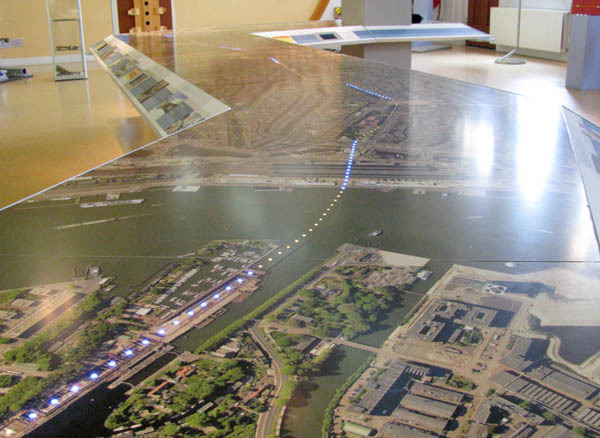 Typical applications for the Twinklers are scale models, planning boards, marquees and video walls, especially if these need real-time updating, independent operation or interactivity. In one of our projects, we have used an industrial, solid-state mini PC running Linux from a CompactFlash card, using the above-mentioned software to drive over 400 Twinklers on a single chain. The mini PC reads its schedule from a USB stick; an updated schedule is prepared off-line, after which the USB stick is inserted in the mini PC. An earlier project used more switches (for input) than the standard software provides, and therefore special-purpose software was developed. The software uses the serial protocol to drive the Twinklers (nearly 80) in various chains. The standard software for the Twinklers, for Microsoft Windows, in a self-extracting setup. The FTDI D2XX drivers (for the USB interface) are included in this package. The standard software for the Twinklers, for Linux, as an "autopackage" installer. See the Instructions for installing an autopackage file if you are new to autopackage distributions. Note: The FTDI D2XX drivers are not included in this installer. 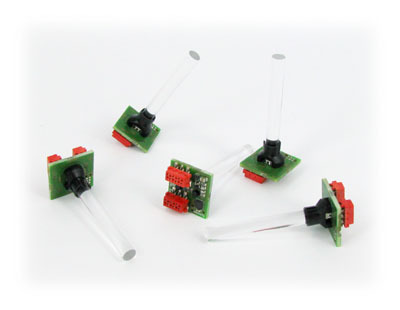 See the link below for the FTDI drivers and installation instructions. When using the USB interface with its native driver interface, you need to install the appropriate USB drivers from FTDI. The page at this link provides downloads for the drivers for Microsoft Windows and Linux. The User Guide covers: connecting and using the hardware, installing and using the software and the hardware specifications. This application note describes the protocol in detail and gives programming examples for several platforms and several programming languages. Two interfaces are covered: (virtual) COM port and FTDI D2XX. The guide and data sheet for the USB interface to drive the Twinklers. For the drivers, see the link to the "FTDI D2XX Direct Drivers" above, or use the virtual COM drivers that may already be available in the operating system. The guide and data sheet for the RS232 interface to drive the Twinklers. The guide and data sheet for the power repeater (to power a string of autonomously running Twinklers or to add additional power supply entries in a long chain of Twinklers). This application note covers storing user firmware in the Twinkler hardware. Note: Although this application note is provided, CompuPhase does not support Twinklers with modified firmware.